Giant-Size Geek: Big Barda by Bruce Timm and Jack Kirby, designer of swimwear! Big Barda is a secret little favorite among comics geeks who hardly gets any attention. She appeared in Mister Miracle but has made very few guest appearances over the years. I always like to see artists that get a kick out of drawing Barda for fans. 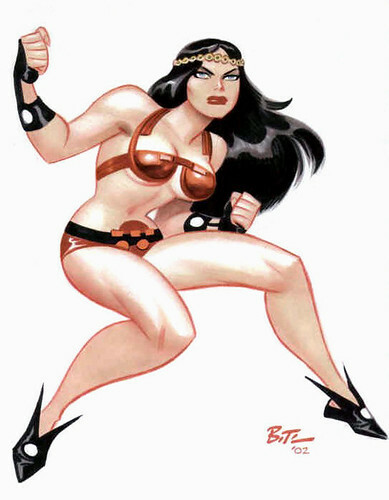 Bruce Timm obviously digs Barda, especially in this outfit. Barda strikes another pose. I started wondering about this battle bikini. Did Kirby really invent it? I recalled that he did and all the elements on that outfit seemed to be designed by the King. The answer is YES! 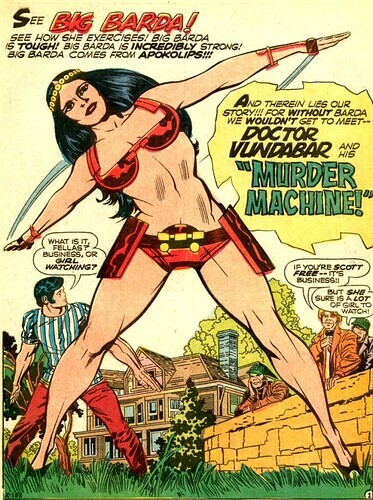 Big Barda’s first appearance was in Mister Miracle #4, 1971. In that issue, Barda first appears in her full-on battle armor, with the blue chain mail. At the end of the story, when Barda is at home with Scott and Oberon, she slips into this bikini—a little something comfortable. Oberon, who didn’t like Barda up until this point, even exclaims: Whoever made that Gal wear a uniform should be horsewhipped! Kirby knew he had designed a great character at this point. The splash page of Mister Miracle #5 from 1971 featured Barda doing Yoga in her swimwear, to the delight of Scott Free’s neighbors. I cannot imagine being a super-villain and facing down Big Barda or Wonder Woman! I do find it incredibly strange that this character has remained hidden in DC Comics for all these years. Nuff Said. Actually, Barda has maintained a presence over the years. She was in the JLA for a while and Gail Simone had her as a member of the Birds of Prey, in addition to her role as a supporting character in whatever Fourth World or Mister Miracle revival DC tries out at any given moment. None of this has really set the world on fire. For me personally, I don't think any creator has ever come close to using Barda as well as Kirby himself did...and I'd just as soon all these characters stay in retirement than lose their remaining luster through overuse. It's too bad, because comics really needs more characters like her!